The details surrounding the last days of Edgar Allan Poe remain as enigmatic and mystery-shrouded as many of his stories. In October 1849, the 40-year-old author of such works as "The Tell-Tale Heart," "The Fall of the House of Usher" and "The Raven" disappeared for five days while traveling by train to New York City. He turned up in a Baltimore hospital delirious, raving incoherently and dressed in a stranger's clothes. Poe died there four days later of unknown causes, having never regained full consciousness and repeatedly calling out the name "Reynolds." 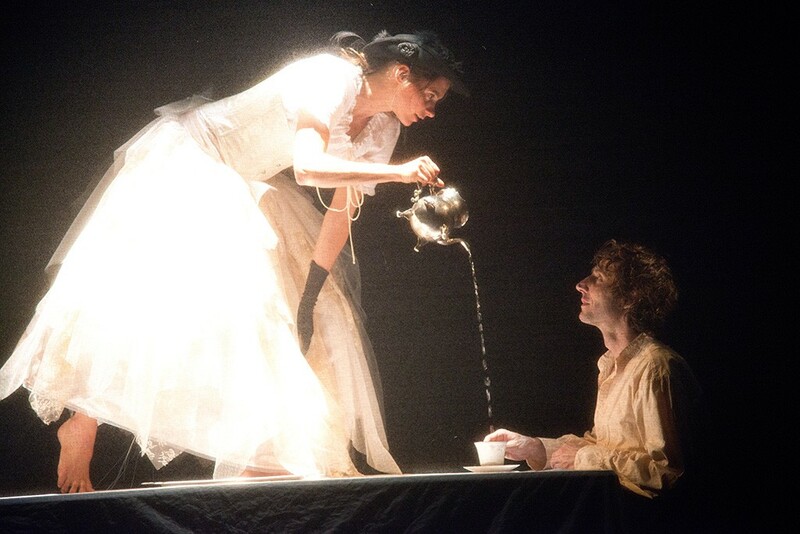 The final journey of the 19th-century master of the macabre is fitting fodder for a sparse yet surreal and visually arresting theatrical work called Red-Eye to Havre de Grace; the name refers to the Maryland train station where Poe ended up. Red-Eye is the work of Denver-born Thaddeus Phillips, who spent more than a decade crafting his "action opera musical" with his avant-garde theater company, Lucidity Suitcase Intercontinental. He brings the piece to the Hopkins Center for the Arts at Dartmouth College on April 1 and 2. In a phone interview from Bogotá, Colombia, where the 43-year-old director, actor and producer lives half the year, Phillips notes that other productions about Poe's life "go hog wild" with big set designs and imagery from his stories. By contrast, "everything here is very minimalistic but very powerful at the same time, to evoke the audience's imagination." Red-Eye is narrated by a Poe historic-site park ranger, who speculates about what may have happened to the writer during and after his fateful train trip. Throughout the story, Poe wrestles with visions of his dead bride and fends off fans who insist he recite his most famous work, "The Raven." Phillips says that, while aspects of this production are, by necessity, speculative about Poe's mysterious end and what was going on in his mind, Red-Eye to Havre de Grace is still very much grounded in historical facts, including details about his personal relationships. The audience need not know anything about Poe's life beforehand, the director emphasizes. But those who are steeped in Poe lore will recognize the truth — or what he calls "plausible speculations on the truth." On Wednesday, March 30, on campus, Phillips will hold a master class for anyone interested in theater or storytelling; it will explore the collaborative, "very intuitive and improvisational" methods he used to develop the play. For example, Phillips collaborated with the composing-performing duo Wilhelm Bros. & Co. He says that Jeremy Wilhelm read many of Poe's personal letters to his mother-in-law/aunt/literary agent, which he then incorporated into the show's song lyrics. Though Red-Eye uses a cast of just four actors, Hop director of programming Margaret Lawrence says this "original, funny and strange" work is chock-full of visual twists and turns. Nothing on stage is fixed, and sets and settings continually morph into other things. "Oh, my God, I loved it! This piece is the best possible illustration of what can happen when really brilliant theater people put something together," Lawrence says. "It somehow brings you into this overheated, feverish hallucination that is remarkably apropos for Edgar Allan Poe."